Since many years, we have been using PostgreSQL as the backend to our DNA Analysis solution. And very successfully so; we now have approximately 10TB of statistics in almost 500 schema's. With the help of google, I soon discovered we may have a corruption in one of the vital tables: pg_class. executing "select oid, * from pg_class where oid = 2613175388" shows we're dealing with a table named ls_tmp1. I know we have some of these tables in several schema's. Notice how the troubled table does not belong to a schema (it should!). Hence the trouble reported in the pg_dump. In order to repair this corruption, I created a new schema named "for_corrupt_table." I then looked up the OID for this newly created schema. 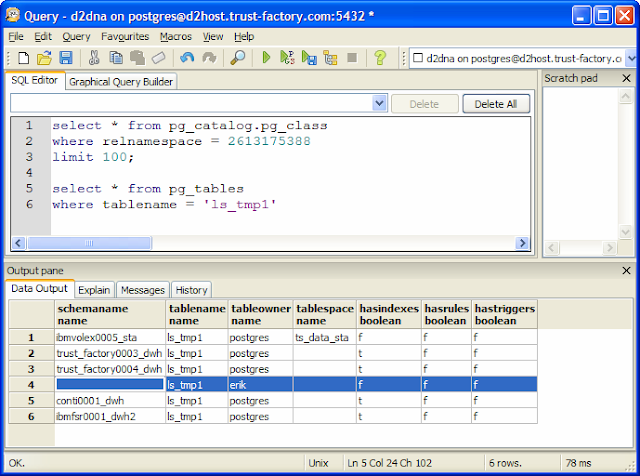 Refreshing my pgadmin window revealed the new schema and the existing table.